Having a pet run away can be devastating, but a WINK News Call for Action investigation found that there are a few big mistakes most pet owners make that could make reconnecting owner and animal nearly impossible. 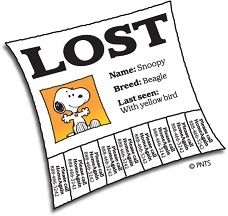 Microchips are the best tool for finding a lost pet, but they are not foolproof. “They’re not little GPS receivers, they don’t tell anybody where your animal is and they only work if you register it,” explained Raphael Moore, general counsel for the Veterinary Information Network. Microchips work by using radio frequency identification technology. The chips are placed below the animal’s skin and are given a unique serial number. When a pet is brought to a veterinarian’s office or to a shelter, a scanner is used to see if a chip is in place and if that chip is registered. But Moore says most pet owners make one crucial mistake. Over the past several years, Delta AirLines Lost and Found has been at the center of numerous tragic stories of regarding pet transports. 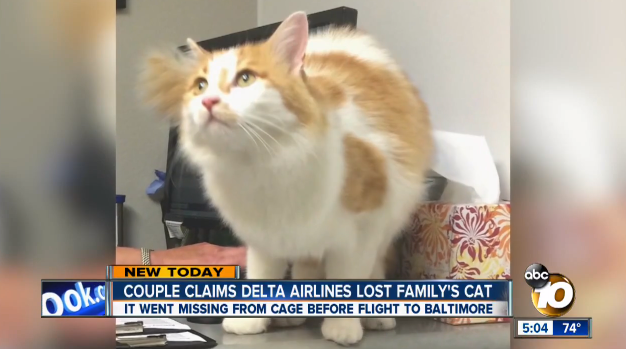 Now, a family who was flying their cat on the airline from San Diego to Baltimore is hoping their tale of loss ends on a happy note. ABC 10 News reports that an hour after a San Diego couple dropped off 5-year-old Mickey at the Delta cargo office Friday night for his trip to be reunited with his owner – the couple’s 12-year-old niece who recently moved out of state – he was missing. The term “dog flipping” refers to when a pet is stolen and then put up for sale on sites like Craig’s List. For a family in northwest Harris County, it hit home last December when their 11-year-old terrier went missing. ‘Sushi’ apparently escaped through a hole in the backyard fence. 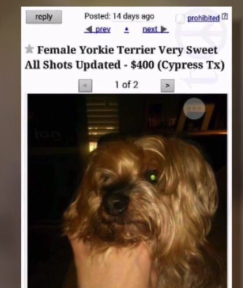 The same day, Kara Lowe’s husband received a strange call asking if he was missing a dog. When the family couldn’t find Sushi, they called the number. The person who answered denied any knowledge of a dog. 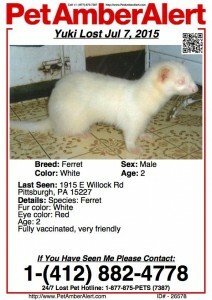 I had completely given up hope of ever seeing my beloved ferret again. Suddenly at 10:30 pm we got a call saying he had been spotted mere minutes ago in an area close by the first sighting. We all rushed out there and searched the area for probably two hours. It was pitch black, we had a crappy flashlight, it just seemed hopeless. We were turning back to our car and I just happened to look at the sidewalk across the street. THERE HE WAS. I dove into the grass as he ran and caught him. I still can’t believe it. He’s alive and in my hands. I’m so happy! 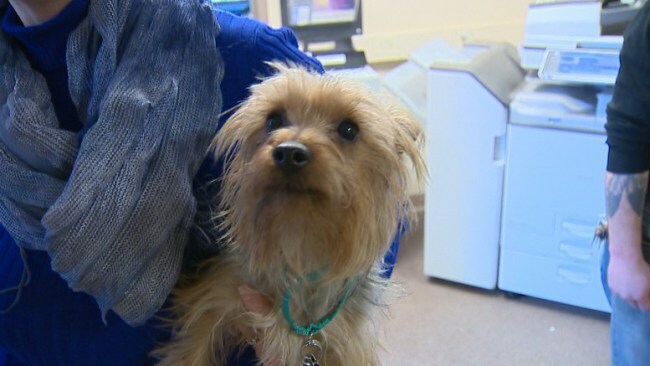 An Arizona woman is expected in Brown County this week to pick up her small dog one month after it turned up in Wisconsin. A local animal control officer took Nicholas, a Yorkshire terrier, to the Bay Area Humane Society on Feb. 6. The humane society says the dog was found wandering the streets in Howard. A check of the dog’s microchip showed it was registered to Linda Baldazo. The officer called Baldazo, who said her dog had been missing for a few months. She last saw it playing outside in her fenced-in yard. Baldazo is scheduled to fly in to Austin Straubel International Airport Friday afternoon to pick up Nicholas. The humane society says it has been trying to get Nicholas back to Arizona for the past few weeks. A return flight was scheduled for Feb. 10, but the weather on that day was too cold for the dog to travel in the cargo area. Morgan Bogle is offering $5,000 for the return of her pit bull, Sugar, who was lost when a dog walker apparently went bonkers. It’s every dog owner’s nightmare. An East Village woman entrusted her beloved pooch to a neighborhood dog walker while she was on a business trip — and he lost the pet in the cold, she told The Post on Tuesday. “I’m absolutely devastated. I want my dog back. I seem like I’m holding it together, but I’m not. I’m on the verge of a complete breakdown,” said Morgan Bogle, 33, who owns a vegan fashion company. 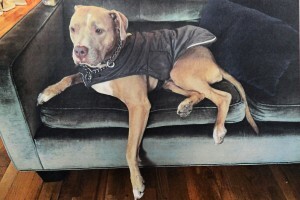 Bogle said she trusted her longtime dog walker to care for her sweet pit bull mix, Sugar — a rescue animal she adopted in The Bronx four years ago — while she flew to London on business last week. But the man flipped out while she was away, kicking the front door of her apartment Monday while shouting and swearing, witnesses said. 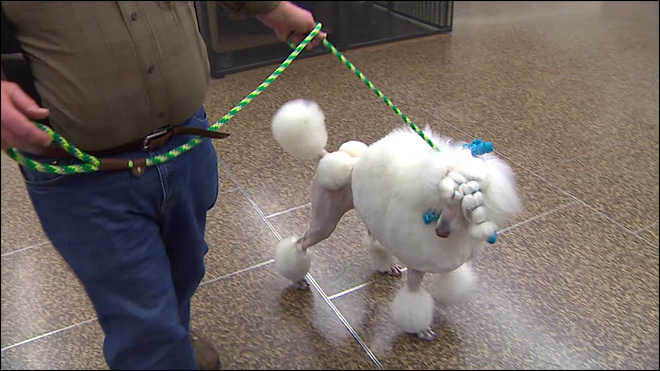 The owners of several dogs returning from the prestigious Westminster Dog Show in New York say Delta Airlines lost their show dogs at JFK Airport. One of those was a standard poodle named Paris. It was the responsibility of the owner’s grandfather, Greg Gorder, to bring Paris home to Seattle on Wednesday. But as Groder was sitting on Delta’s 4:05 p.m. non-stop flight from JFK to Sea-Tac Airport, he and other show dog owners on the flight didn’t see their dogs being loaded into the cargo hold of their Boeing-737. I HAVE TO THANK YOU SOOOOOOOOOOOOOO MUCH! YOUR SERVICE REALLY WORKED! MY NEIGHBOR GOT A PHONE CALL FROM YOUR SERVICE TODAY & THEY CONTACTED ME. I WAS REUNITED WITH MY BEAUTIFUL PUPPY. I AM SO THANKFUL FOR YOUR SERVICE! I HUNG 40 POSTERS EVERYWHErE BUT YOUR SERVICE IS WHAT BROUGHT MY DOG BACK TO US!!! THIS IS TRULY A MIRACLE!